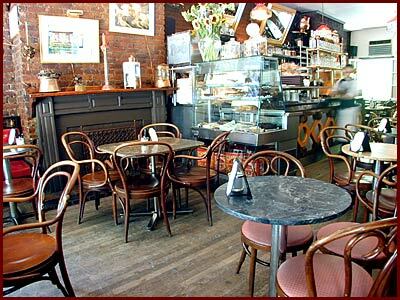 "Located right near Washington Square Park, La Lanterna di Vittorio is the ultimate West Village café, the ideal place to feed each other Italian ricotta cheesecake or tartufo and other gelati desserts, sip cappuccinos with amaretto and whipped cream, and while away the afternoon. There are two working fireplaces, one upstairs and one down. Several genuine suits of armor point the way to the downstairs bar/café. Desserts, coffees and teas, and other beverages – such as 20 flavors of frozen granita – dominate the menu, but there is a fine selection of Italian-style sandwiches (panini), soups, and salads as well. The upstairs has an old-time soda fountain feel, while the downstairs is darker and looks more like a speakeasy. There are many, many casual cafés in Greenwich Village, but this is my favorite and, I believe, the one most conducive to romantic feelings.